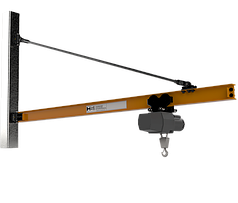 Jib Cranes provide lifting solutions when overhead bridge cranes do not meet the needs. 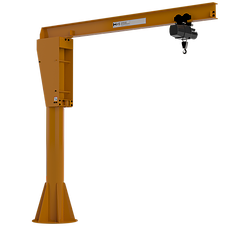 There are many options of jib cranes including wall mount, mast type and free standing. These can come in manual or full powered options. Mast type jib cranes utilize existing building structure or brackets at the top and floor mounted on the bottom. These can be provided with the need for footings. Rotations can be manual, chain geared or powered. Higher capacities and spans are available. 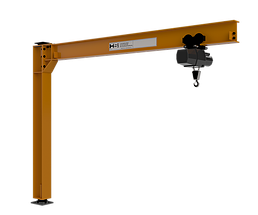 These jib cranes are designed for heavier applications. The rotation can be manual, air powered, chain geared or full powered. They typically require footings but light duty free standing jibs do come in foundationless options. 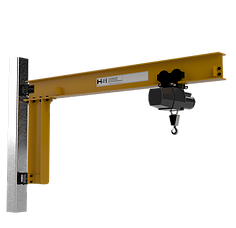 These cranes are mounted on existing building colums and eliminate the needs for impacting floor space.There are 2 options for wall mount jib cranes.